Hailing the Narendra Modi government for its agenda of "inclusive growth", union Human Resource Development Minister Smriti Irani on Sunday said the real change in West Bengal will happen only when her BJP comes to power. "Development is about uplifting the poor and the BJP government has taken several measures to ensure inclusive growth. 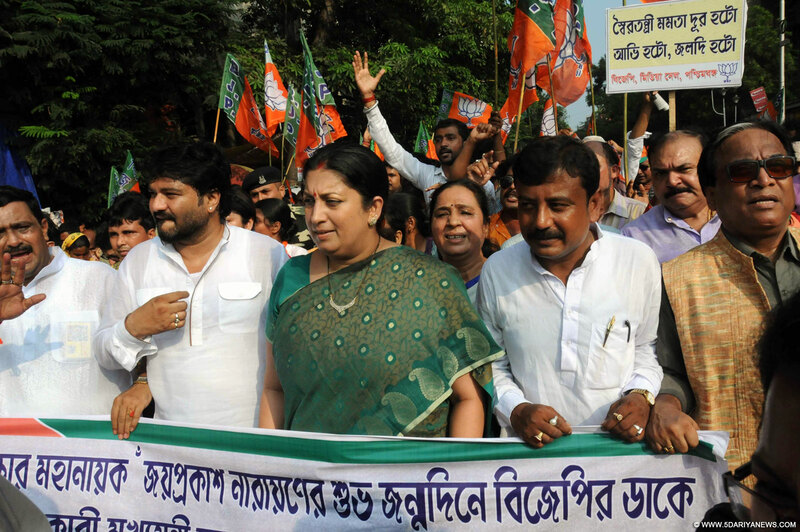 The change that has been initiated at the centre will be complete once the BJP comes to power in Bengal," she said here.Irani, along with fellow union minister Babul Supriyo, participated in a party rally demanding Chief Minister Mamata Banerjee's resignation over the Trinamool Congress' alleged strong arm tactics during the recently-concluded polls to some civic bodies in the state. Supriyo, the minister of state for urban development, slammed the Trinamool for murdering democracy. Demanding Banerjee's resignation, state Bharatiya Janata Party president Rahul Sinha said the Trinamool will be defeated in the next assembly polls and it will not be able to employ its terror tactics which it did during the civic polls.Amid allegations of widespread violence and malpractice, Trinamool registered emphatic victories in the polls to the municipal corporations in Bidhannagar, Asansol and parts of Howrah.